With multiple movies coming out this year (not to mention a hit TV series), Dwayne “The Rock” Johnson is one of the hardest-working actors in show business. Just take a look at the rigorous workouts he posts on his Instagram account, where he also shared his unbelievable daily schedule. It’s amazing that the guy has time to sleep. Between starring in movies and an HBO show, producing all of his projects, pumping iron, and being a dad, there doesn’t seem to be anything The Rock can’t do. But this year, the actor and former pro-wrestling superstar has cooked up his most surprising role yet: playing himself in the upcoming movie FIGHTING WITH MY FAMILY, based on the true story of WWE star Paige. 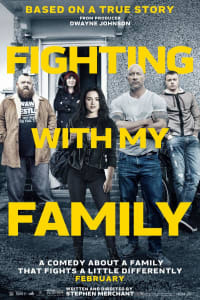 FIGHTING WITH MY FAMILY is based on a 2012 documentary which traced the rise of professional wrestler Paige. The British personality, born Saraya-Jade Bevis, is the daughter of two former pro wrestlers: Patrick Bevis and Julia Hamer-Bevis. At 13, Saraya-Jade made her debut as a wrestler, and by the age of 15 she was working as a bouncer and a bartender at her parents’ bar. In 2011, Saraya-Jade tried out for the WWE and made the cut, first wrestling for NXT (formerly Florida Championship Wrestling) before joining the official WWE roster in 2014 at the age of 21. At that point, Saraya-Jade, now known as Paige, had already become the youngest Divas Championship winner. Despite her quick rise to stardom and her status as a fan favorite, things didn’t go so smoothly for Paige. She went on hiatus following an injury in 2016. Paige was subsequently suspended from the WWE under somewhat mysterious circumstances. Not long after returning to pro wrestling in 2017, Paige shocked the world by announcing her retirement. In FIGHTING WITH MY FAMILY, Johnson plays a slightly fictionalized version of himself. Although the movie takes place several years ago, when he was a bit younger, he doesn’t seem to have much trouble pulling it off. The star’s intense commitment to fitness and health help him with the role. He hasn’t aged a day! This role is a bit more challenging than starring in a big action blockbuster, but Johnson is up to the task. While the WWE is primarily focused on wrestling, there’s a lot of acting involved in the ongoing storylines (which are sort of like soap operas) and in properly staging the fights. By now, The Rock isn’t just a pro wrestler — he’s a professional actor, too. And he’s willing to play himself as a guy who isn’t always the most helpful person around. Perhaps the biggest challenge for Johnson in FIGHTING WITH MY FAMILY — and what makes his role as himself so surprising — is that this isn’t his movie. 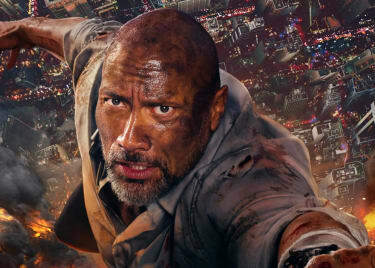 Fans are used to seeing Johnson as the big hero in action movies like SKYSCRAPER, RAMPAGE and BAYWATCH, but for the first time in several years, he’s not the main attraction. This is the story of Paige’s journey in the WWE. 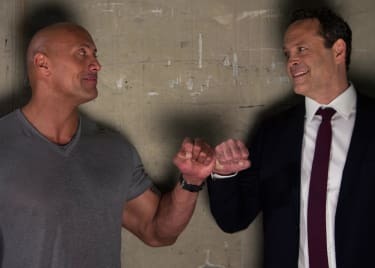 The Rock is just a co-star. For someone who is accustomed to being the star of the show, playing a smaller, supporting role can be even more difficult — and requires more acting skill. The real star of this show is Florence Pugh, a rising British actress who plays Paige. Even though he’ll be playing second fiddle this time around, we can’t wait to see what The Rock has cooked up. FIGHTING WITH MY FAMILY comes to AMC theatres on February 14!